I hope you have been enjoying my blog as much as I have enjoyed writing it thus far. You’ll have noticed a silence recently and for that, I apologize. Don’t worry, I’m still alive and making my way to Saigon. I’ve been working on a few others things which I'll be sharing with you soon, and I’ve also been spending some time reading and focusing on and developing me. It is amazing how much time blogging, photography and social media takes up. I’m very aware that some of my blog post have taken some reading with my want to share some of my experiences with you, but I’m also aware that sharing some of these, might just get lost in writing. Believe me, I've barely scratched the surface of sharing my experiences and stories with you. It's a never-ending journey of stories and new experiences, just as life should be and how I will be living it from here on in or out. From here on, I will try and structure and refine my writing, with less content and more images where possible. My next food and recipe blog will cover all of Vietnam, North to South, so expect to see that in the coming month. I’ve got some outrageously delicious and simple recipes in-store for you guys, including; Fresh Spring Rolls, Fried Spring Rolls, Bun Cha and Pho. One thing is for sure, Fresh Spring Rolls will definitely be a part of my life from here on; just awesome. Due to my inactivity in writing, I’ll now be writing a month behind which I’ll explain through each post, until I am up-to-date, which shouldn't take long at all. This post, for instance, is from between 13 February – 26th February, more than 2 months ago. However, the next post will be short and sweet and will include my route and a lot of cycling south from Hanoi to Hoi An via lots of random towns and cities off the beaten track. Until then, enjoy this post, thanks for your continued reading and following my adventures and keep on smiling. On the 13 February, after an eventful and pukey (not me for once) 10-hour bus ride and an awesome but uncomfortable 12km ride, weaving through busy traffic, Christian and I made it into Hanoi, the capital of Vietnam, with Mike still in the wilds of North West Vietnam. My journey to date had started in Chiang Mai, through the mountainous Issan region of Thailand, into and the length of Laos from Vientiane to Pang Hoc, south to north, and now into Vietnam, but I’d yet to experience the real hustle and bustle of a major city. Since arriving in Vietnam 4 days before, I, and the boys had become familiar with the fumes of vehicles, and the beeping of anything with wheels and maybe some without, but Hanoi took this to a whole new level. The pollution is immediately apparent, with the sky a thick mass of smoke and fumes. The roads saturated with vehicles, mainly motorbikes moving in every direction, in what can only be described as organized chaos. Despite the pollution and the chaos to every sense, which can’t be avoided, you’ll find a city bustling with life, character, architecture and great food. In the heart of the city, is the Ba Dinh district, more commonly known as the Old Quarter and the Hô Hoàn Kiêm Lake, known as the ‘Lake of the Restored Sword’; both hotspots with tourists far and wide. The Old Quarter, with its colonial architecture, food laden streets and rich history spanning 2,000 years, is the liveliest of them all with markets, restaurants, hostels, hotels, craft shops and ‘North Face’ clothing and accessories everywhere. The jury is out as to how much actual ‘North Face’ is in this ‘North Face’ gear, but it’s available nonetheless. Christian and I had booked into the Hanoi Old Quarter View Hostel in the Old Quarter and my first hostel since being on this trip. Hanoi Old Quarter View Hostel is located at: No 3-5 Noi Mieu Lane, Hang Buom, Hoan Kiem, Hanoi, 100000 and is an excellent, cheap choice in Hanoi at around 150,000 VND or £5 per night, including breakfast, and a great way of meeting different types of people. Rooms are available in dorms of 4, 6, 12 & 18, and all are very clean and super comfortable. Unlike a lot of other hostels in Hanoi, Hanoi Old Quarter View Hostel is set back from the main street and is a nice quiet option, with free beer from 6 – 6.30pm every night. Sweet! After unloading our stuff, Christian and I went out exploring Hanoi and grabbing food and drinks. We made mental notes of a few things that we passed in preparation for Mikes arrival the following day and for Tết celebrations, which is the Vietnamese New Year and the biggest cultural celebration of the year, and it goes off, everywhere. 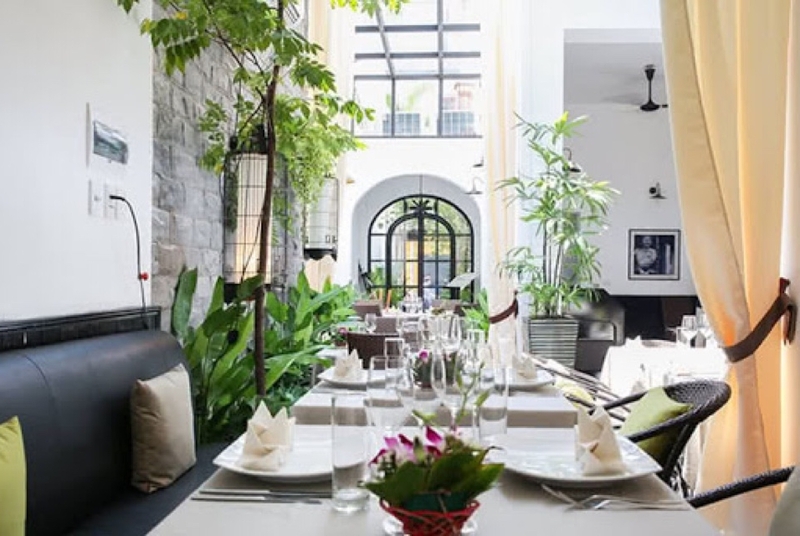 Central to the experience of Hanoi is the food on offer, with dishes like Bun Cha, Pho and Hanoi Spring Rolls or Bun Nem, available around every corner and known as ‘real’ Hanoi food. Banh Mi is all over Hanoi also, and to be honest, you’ll struggle to find a bad one. Banh Mi is a big part of Vietnamese culture up and down the country and very worth trying. Some of the best Banh Mi I’ve tried have been in the middle of nowhere and cost about £0.30p! Awesome! It’s funny, some of the very best Banh Mi and Pho I’ve eaten have been from places your ‘inner chimp’ would highly warn you against. One particular place Mike and I had excellent Pho in, had the most offensive toilet known to man. I was literally gagging whilst taking a whizz. That evening, Christian and I chatted to so many different people at our hostel and we ended up going out for dinner with Yaniv, a really cool, bright, proper New York Jew, who grew up in New York but moved back to Israel, and work’s in the crypto currency market. He was blind in one eye, which was almost white. Lucia also came out for dinner and Luci is a criminal lawyer and pole-dancer (that combo is marriage material) from Argentina was also staying at our hostel and was also really cool and great fun. We ended up having quite a bit to drink, with shots and beer, then heading for a delicious dinner at Green Farm, a great restaurant in The Old Quarter. After a great night sleep in a very comfy bed in Hanoi Old Quarter View Hostel and being grabbed in the night by Christian, who was sleeping in a separate bunk next to me, we awaited Mike’s arrival. It was funny, having forgotten about it, 2 days later Christian asked “ Dude, did I grab you in the night, the other night?” which we laughed at and still makes me laugh now. Mike arrived very early on the morning of the 15th Feb, having ridden for another 2 days of pure up and down hill’s after we left him. During Christian and my absence for a few days, Mike had developed a love for Pho, which became our go-to lunch option during our time in Hanoi. That, and the Kebabs- oh jeez the kebabs! We stayed in the hostel for 3 days and it was great fun. We met Mary, a lovely American lady from New Jersey in her late 60’s, who loves traveling all over the world on her own. We grew fond of Mary with her strong New Jersey accent and would sit with her at breakfast each morning, chatting about all sorts. She was cool. That evening, and in celebration of Mike’s return, we decided to indulge in some cannabis absinth, which Christian and I had spotted the night we arrived. This was an interesting and dangerous experience, with the inexperienced waitress nearly engulfing herself and the table on a couple of attempts. These were made the traditional way with the sugar being melted into the absinthe. At 89.9% proof, this really got the saliva flowing. We were very lucky to be in Hanoi to experience Tết, the lunar Vietnamese and Chinese New Year, which is the biggest celebration in the Vietnamese year. Much like me, the Vietnamese don’t do things by halves, and very much take a ‘Go Big or Go Home’ approach, and for Tết, they actually do both; go big and go home. Hanoi, the capital city of Vietnam, is at the top of the list of places to experience and celebrate Tết. Tết traditions actually begin one or two weeks before Tết, when legend has it that the Kitchen God rides a carp up into the heavens and reports on the things that have been happening over the course of the year. He then returns back on the 30th of the last month of the Vietnamese calendar. On this day, families gather together, preparing food and paper creations to dedicate to relatives that have passed away that year. Parties are thrown in family homes all over Vietnam during this evening; mothers cook up food, families watch comedy shows together, and everyone anxiously awaits the celebrations to come. At midnight, the family joins to light incense sticks on alters, which signify asking God and deceased relatives to come and join them in spirit. Christian, Mike and I saw in the celebrations right in the thick of it, at the buzzing Hồ Hoàn Kiếm Lake, along with thousands of others, watching the incredible fireworks light up the smog filled sky and watching the many generations of local families coming together. It was very special and a real treat. I like to immerse my self in culture and integral to that is picking up important bits of the language, so I took it upon myself to learn “Happy New Year” in Vietnamese, translated “Chuc Mung nam Moi”, which is easier read than said, considering Vietnamese is a tonal language and pronunciation is extremely important to the meaning of both words and phrases. Nevertheless, I spent most of the day perfecting “Chuc Mung Nam Moi” over and over again, until I finally got it. With my new found phrase perfected, I continued, for the entire evening, and probably a week or 2 after, saying “Chuc Mung Nam Moi” to every passing Vietnamese person, which would often get a big smile and a “Chuc Mung Nam Moi’ in response. 1. Don’t make too many plans, and if you do, expect them to be disrupted. 2. Expect restaurants, museums, art galleries, and everything else to be closed during Tết, so it can be a difficult time of year to do anything. Stock up whenever you can, and simply go with the flow. 3. Expect Beaches to be very busy and cities like Hanoi to be very quiet, a very rare phenomenon. 4. Travel around this time can be hectic and dangerous, so avoid where possible. 5. Pagodas and Buddhist temples are very very busy at this time of year. With Tết celebrations still in full flow, we three amigos decided a bit of Airbnb luxury was in order for a few days. With that luxury, came an ill-equipped kitchen to play with. The 5 storey house was a just outside of the hustle and bustle of the Old Quarter, and it was great to see and stay in a different part of town for a few days. We took a great ride out to a very cool and professional bike shop called ‘The Hanoi Bicycle Collective” http://thbc.vn/ or THBC as it is known as, for Christian and Mike to organize bike boxes for their bikes, as they would soon be heading back to Alaska, via Hoi An and Saigon after some very last minute and panicked travel planning. For any bike tourers in Hanoi, head along to THBC and Prateek will look after you. Great guy. Mike actually ended up going downhill trail riding with Prateek the manager in the hills just outside of Hanoi, which sounded awesome. I would have been 100% in for that, had I been fit enough and with the bigger picture in mind. I was looking forward to some cooking, so we hit the markets in search of Hanoi’s finest ingredients, which involved an unpleasant attempted conversation with a woman selling meat on the side of the road. who instantly took a dislike to me it seemed. I spotted a pigs head on the floor and asked for the cheeks, so after about 10 minutes of being seemingly ignored, she cuts of the skin and fat of the cheek, and tries to give it to me. I courteously decline and point at the cheeks, to which she offer’s me the fatty cheek again, which I courteously decline. At this point, with a fair size cleaver in her hand, she throws the skin back on the pigs head and continues talking to someone else. “Hmmm, not going well I thought”. We ended up skipping the meat part for now and going straight for the veggies and noodles. With every dinner, should be a drink of choice, and ours was homemade Mojitos, with homemade (by me obvs) ginger sugar syrup and loads of mint and lime. The market’s of Hanoi a very worth a walk around, even if you aren’t actually going to buy anything or a big food lover, as it’s a massive part of Hanoi and Vietnamese culture and just an authentic experience. Although noodles are a prominent feature in my diet here in Vietnam, when you see fresh rice noodles being sold on the side of the street from an old women with a woven basket, you can’t help but feel obliged to revel in the experience. Street market Hanoi. Oodles of fresh noodles. Noodles purchased, it was time to return to the angry women with the big cleaver. This time simply opting to point out one bit of beef fillet and one bit of pork strip loin, which I’m pretty sure she took me for a ride for on the price, but I wasn’t going to argue with this already irate, but probably lovely, woman. A few ours later dinner and very punchy Mojitos were served. Marinated beef noodles with veggies, lime, coriander and peanut. Well fed and lubricated from the Mojitos, it was time to hit the town and that’s exactly what we did, as did thousands of others. Christian and Mike were leaving in a couple of days and having spent the past 2 weeks with them from Laos, which had been awesome, it was time to start planning my own solo route again and ticking off a few last minutes things on my Hanoi itinerary, including a cookery class. We moved back to Hanoi Old Quarter View Hostel for a night and the following day we said our goodbyes, but each knowing that we’ll see each other again. Christian, Mike, what a pleasure dudes. It’s not something I say to many new people I meet, but I feel like I’ve made good friends in you two. Keep the rubber side down. Updogmillionaire. It was time to get all my gear together and focused on getting back on the bike, which meant wanting my own space, so I decided to get another Airbnb outside of the Old Quarter. I spent my last few days in Hanoi blogging, and stocking up on various supplies, including Rock Tape from the American Chiropractic Clinic. After organizing myself and getting some laundry done, it was time for lunch, and this time, instead of a £1.00 Pho, which is always delicious may I add, I had booked myself into La Badiane, a well-reviewed French restaurant and a treat to myself. The décor wouldn’t look out of place in any major city in the world and with a tasty looking menu to match, I was very much looking forward to the food and the wine. I chose the set menu, and to start I had the ~ red tuna maki & candied onions in ginger with wasabi dressing, for the main I had the ~ duck leg confit in spices, mashed cauliflower and orange sauce and to follow, I chose the ~ pineapple & mango carpaccio with lime sorbet. 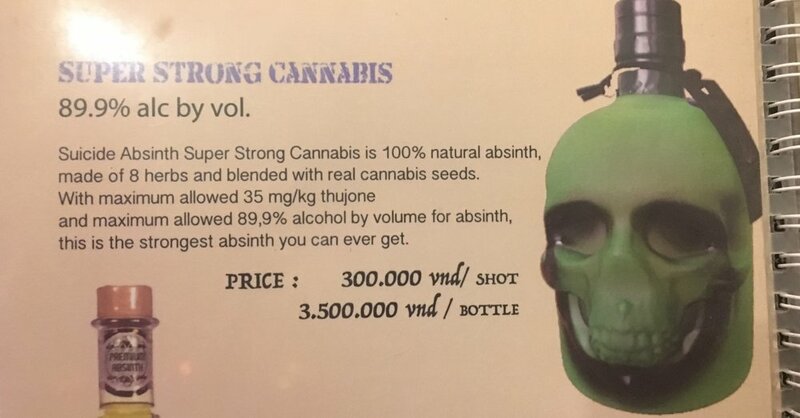 All of which was absolutely delicious, and at 395,000VND or a little over £12.00, you really couldn't go wrong. Add a glass of white and a couple of glasses of red and you’re looking at a bit more, but still, excellent value. As smart as it gets at the moment. My Airbnb was perfect, with a separate living and kitchen area, and was located directly next to Don Chicken, a chicken food chain across Vietnam, which is quite possibly some of the best chicken I’ve ever eaten. I ended up having this for dinner after my lunch at La Badiane, and as takeaway, then chilled out the rest of the evening. Delicious, ultra crispy and moist chicken, coated in a variety of sauces including sweet and spicy which was just awesome. The following day was my last day and it was time to get my ‘chef on’ at the Apron Up Cookery School. The Apron Up course was actually my second choice cookery class in Hanoi, but was excellent and I'm glad I did it there. One thing each cookery class will say is not to make notes, because “it’s all in the recipe book”, well, it’s not, so my advice is to take loads of notes and photos if you want to replicate the same dish. The class was simple, yet great, with Pho, Bun Cha, Hanoi Spring Rolls (Nem) and Vietnamese egg coffee on the menu. The latter tasting very similar to Tiramisu and will certainly feature on a dinner party menu in the future. The class started with a very informative walk around the local traditional food market with our teacher Vivian, who, in perfect English, explained the main ingredients in Vietnamese cuisine, and where we collected the ingredients we’d be using. There were 7 of us taking the class, and we all had our own, individual stations, which makes for a much better learning experience in my opinion; when learning about food and most things really, seeing and doing are two very different things. Hanoi had finally returned to some normality after Tết, which only meant there was more traffic on the roads, more people and more pollution. The weather in Hanoi had been pretty hit or miss, with rain on and off the over the past few days, so when the time came to leave early in the morning, it was no surprise to me that it would be pouring down with rain, but that wouldn't ‘dampen’ my spirits, and, with a big grin on my face, I road out of Hanoi, through some very small back streets on my way to Cat Ba Island, Halong Bay, the UNESCO World Heritage City.